Bloomberg Gadfly's Lisa Abramowicz (follow her on twitter here) outlined in a recent piece The Credit Boom that Just Won't Die the insatiable demand for investment grade credit. Last month, bankers and investors told Bloomberg's Claire Boston that they expected U.S. investment-grade bond sales to finally slow after six consecutive years of unprecedented issuance. But the exact opposite seems to be happening, at least if the first few days of 2017 are any guide. The debt sales are accelerating, with the biggest volumes of issuance ever for the first week of January, according to data compiled by Bloomberg. Lisa followed up this morning with a tweet outlining similar demand within high yield pushing the spread to treasuries to 3.83%, the lowest level since September 2014. That 3.83% option adjusted spread is the excess yield a high yield investor demands above a treasury bond of similar duration. Note that I did not say to be paid above a treasury bond of similar duration. The reason is historically high yield bonds have (on average) returned ~3.5% less than their yield going back 30 years due to credit events (the chart below is from a previous post The Case Against High Yield). 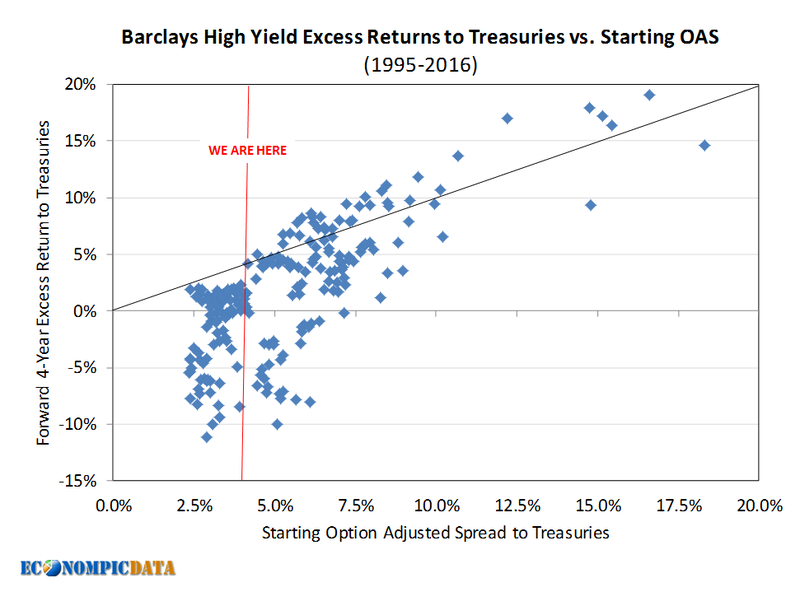 As a result, with a current option adjusted spread of 3.83%, if high yield bonds returned what they have returned relative to their spread ON AVERAGE since 1986, high yield bond investors should only expect a forward return that matches that of a treasury bond with similar duration (with a whole lot more risk). The next chart compares the option adjusted spread "OAS" of the Barclays High Yield Index relative to the forward excess performance vs treasury bonds of a similar duration since 1995. Note that yield to worst data goes back to the mid 1980's, whereas OAS only goes back to the mid 1990's hence the different time frame than the example above. The chart clearly shows the strong relationship between the two, but note that the upside potential of high yield is much more symmetrical at higher OAS levels, whereas there is more downside when starting OAS is at lower levels. This is driven largely by where in the credit cycle we are when OAS is low (often near the end) vs when OAS is high (often near the beginning). 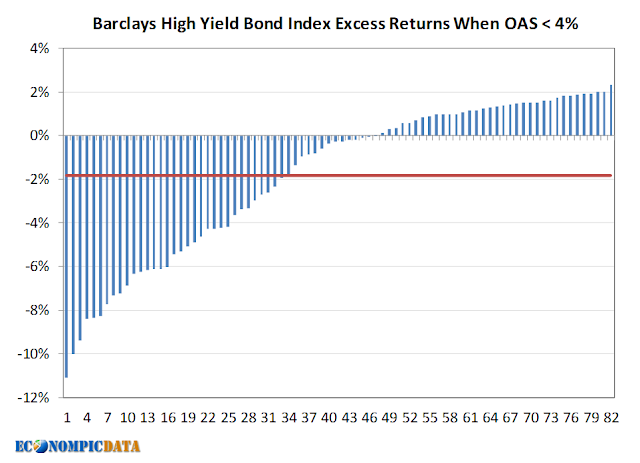 In fact, we can see in the chart above that when we were at similar levels of OAS as we currently sit, high yield has never provided excess returns to treasuries more than its starting OAS. 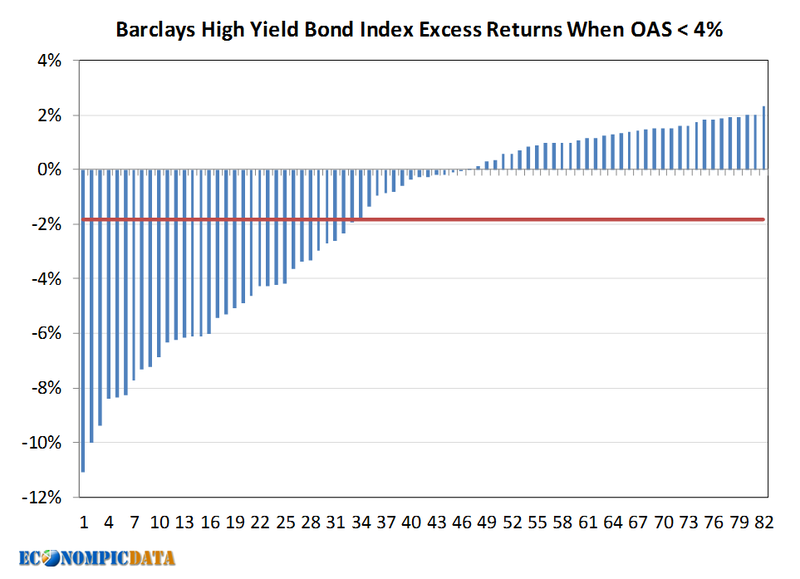 In fact, the chart below breaks out each of these ~80 starting periods when OAS was less than 4% and we can see that not only did high yield bonds underperform their starting OAS in every instance, the likelihood of underperforming treasuries has been much more prevalent (and with a higher degree of underperformance) than the likelihood of outperforming treasuries (the red line shows that on average high yield bonds underperformed treasuries by 2% at similar levels). So if you are looking at the low yields of treasury bonds and searching for an alternative or believe that the spread of high yield may help cushion performance from any further rise in treasury rates, I would tread very carefully.